So, I need to say something... shocker, I know. Lately, I've been getting comments about the large quantity of food - specifically desserts - that I seem to consume on a daily basis. Whether or not these comments are coming from a good place or not, it still hurts. I know I eat a lot and it has no affect on the amount of exercise I get on a daily basis. There are days when I'll go out to eat with friends (and of course, I tend to indulge on these outings) and then I realize I didn't have time to get my workout for the day. Things happen, and I get over it. Yes, there used to be a point in my life when food meant excessive exercise and desserts rarely made an appearance, but I'm in a great place and I love the way I eat & the way I feel after I get a nice cardio session in (even if it's swimming and walking instead of running). For lunch, I was kind of channeling a subway-inspired veggie sandwich... except with all my own veggies AND the magic of a George Foreman. I chopped up onion, tomato, lettuce, and yellow pepper, which I added to a spinach lavash wrap, reduced-fat cheddar cheese, feta crumbles, and mustard. The lavash wrap was a nice, toasty contrast to the fresh veggies and the melty CHEESE! My roommate was basically salivating while I inhaled this -- that's right, I still haven't learned how to chew like a grown up. Maybe... one day. I took a nap (Arabic really drains you -- so does swimming!) and I went to my least favorite class. Empirical analysis and quantitative methods of Political Science? Can you say snooze fest!? Luckily, I have an amazing friend in that class... and for about half the class I thought about what I wanted for dinner. As soon as we left the lecture hall, it took us about 1.5 seconds to decide that we wanted Mediterranean food -- which can really only mean one thing. LA MED, baby!!!! Only the best Mediterranean restaurant in the world (how cool is it that I can walk there from class in under 20 minutes? The rest of the world is really missing out). We picked up her roomie -- also one of the greatest girls EVER -- and headed out for a girl's night. Chopped Med salad with a tomato vinaigrette, pomegranate chicken on top of meditarranean rice pilaf, a spinach and feta filo wrap, a levantine sandwich roll, a chicken cinnamon and raisin filo wrap, fresh fruit and cheese, and hummus!! Annie ordered the "small plate" of cheese and fruit... which is SO NOT small. Then, we walked next door to another favorite spot for some sweets. 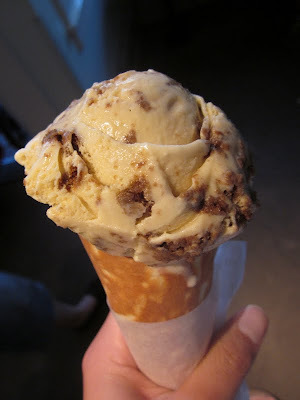 I got a scoop of maple gingersnap on a homemade waffle cone with a chocolate tip. On days when you're heart gets trampled on, on days when you can't seem to do anything right, on days when you're a little too stressed for your own good.... ice cream warms the soul. It's a girl thing. by the way -- we were talking about communism in our lecture today and I was really tempted to raise my hand and state "There are only two kinds of people in this world: those who love chocolate, and communists" but I didn't think people would find it nearly as funny as I do.. It really doesn't matter how much you eat, as long as you're healthy, that's all that matters! And I actually don't think you eat too much, I think you're just one of the few people that's honest! 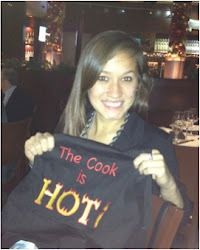 Thanks, girl! I definitely think I could do without an extra dessert here or there... but why would I want that? !